Optical loss of up to 120 dB can be measured using the high output (+10 dBm) light sources and the high sensitivity (-110 dBm min.) sensors. The DFB-LD light sources have a high output of +10 dBm while achieving a stability of better than < ±0.005 dB and a centre optical frequency stability of better than < ± 2 GHz, facilitating high-stability and high reliability measurement. A complete line up of DFB-LD light sources for optical frequencies meeting the ITU-T recommendations for Dense WDM (DWDM) networks (191.7 to 195.9 THz at 100 GHz interval) is available. Under reference conditions, the optical power measurement uncertainty is < ±2%, and under actual operating conditions, it is < ±3.5% with a linearity of better than < ±0.01 dB. These excellent specifications permit measurement of optical power with high accuracy and repeatability. Even without a reflection / suppression adapter, the sensor return loss and polarisation dependency are 40 dB min., and 0.02 dB max. 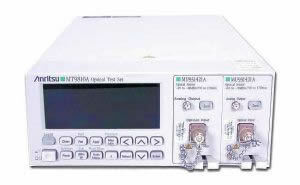 respectively, making them ideal for evaluating devices and systems that use optical amplifier. The optical sensors have a maximum bandwidth of 100 kHz (approx. 3 dB), permitting measurement of optical power variations with a response speed of approx. 10 ms. Since GPIB and RS-232C interfaces are standard, measurement can be controlled from a remote PC. In addition, the LabVIEW ® software driver bundle makes it easy to configure a remote measurement system. The centre optical frequency of the DFB-LDs can be varied in a range of < 60 GHz (approx. < 0.5 nm). Moreover, it can be displayed in frequency and wavelength units [lambda (m) = c (m/s)/f (Hz), where c is the velocity of light in a vacuum (2.99792 x 108 m/s)].